The realm of Asgard has an uneasy peace with the neighboring realm of the Frost Giants, but when some of its inhabitants intrude in Asgard palace’s weapons hall, impetuous Thor interprets it as an act of war. Odin, king of Asgard, banishes Thor from his realm to suffer penance for his rash actions and learn humility among humans. 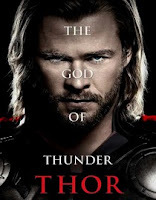 Directed by classical thespian and director Kenneth Brannagh, Thor benefits from a solid screenplay that combines elements of superhero fare and Norse mythology, and the classical training of the movie's director. The result is a very polished production that is, at once, visually lush, smart in concept and development, and with a great cast ensemble. There is newcomer Chris Hemsworth, in the leading role, who by the way looks like Thor himself, and seasoned actors of the caliber of Anthony Hopkins as Allfather Odin, Renee Russo as Odin's wife, Natalie Portman as Jane, Thor's love interest, Stellan Skarsgård as Erik, Tom Hiddleston as trickster Loki, Idris Elba as Heimdall, Asgard's Gatekeeper, Clark Gregg in a small role as Agent Coulson of S.H.I.E.L.D., and Jeremy Renner in a cameo appearance as Hawkeye. This one sounds good too. Not usually my thing but I may give it a try. I like the cast! The cast was the icing on the cake. I'm not really a Marvel comics kind of girl but Hemsworth is always a bit dreamy. I'm glad they stuck him in the movie In the Heart of the Sea. He's easy on the eyes. He is dreamy, I agree. I have yet to watch In the Heart of the Sea. I hope I like it. Thor was very good, Jessica, I agree. Cinderella, as you know, I loved...And sumptuous is a good word to describe it.